What better design for summer than a bright pattern of popsicles, polka dots, and stripes! This design will be sure to brighten your day every time. This design is a fun light teal, with pops of lime green and other bright colors. 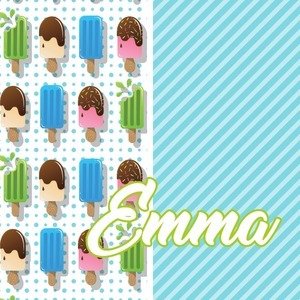 This design is split right down the middle so that you can have two fun patterns on either side The left half are four different kinds of popsicles that repeat in this cute design, with teal polka dots sitting behind them. On the other half is your fun slanted teal stripes pattern. The personalization is located in the lower right corner to shake things up a bit. Easily change the name to a fun graphic if you like! Have fun personalizing your design by changing colors and design elements. Let us know if you need any help! Happy designing!